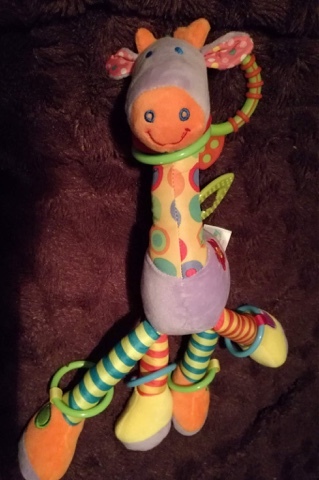 At 19 inches tall this is quite a large activity toy for a baby. Although it's big it is quite light so babies can manage to hold it. 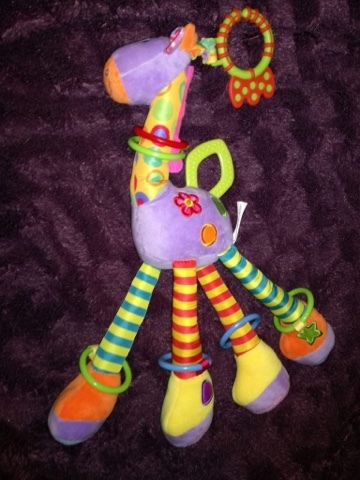 There are lots of rings on the giraffe’s legs and neck which babies can hold or move and rattle them. The rings move around and jangle which keeps our little one entertained. The rings are also safe for babies to mouth or chew on. The giraffe is very bright and eye catching so it easily captures my girl’s attention. I love the design of this toy, it's so cute. It also attaches safely to a pushchair so there's no chance of your baby losing it when you're out and about.